The camera has a lot of technology stuffed into its frame. Besides a built-in flash, it has a proper hot shoe, which can also take an optional optical viewfinder. It's got a 3" LCD and all the usual doodads one comes to expect these days. ISO range is 125 to 6400. It's got an AF assist lamp, multi-exposure mode and interval shooting. They even managed IBIS (In-Body Image Stabilisation1) which should finally put paid to all those arguments that one needs a large body for this "frill". Amazingly, the camera has IR sensors for remote control on both the front and back of the body. Rather than a zoom, the body kit comes with an 8.5mm f/1.9 lens, which is a fast normal...or so it appears (read on, Macduff2). Also available is a 28-83mm equivalent f/2.8-4.5 zoom. An interesting design choice puts the shutter in the lenses rather than in the camera body. This allows for a 1/2000s flash sync speed that makes many other systems green with envy. The second cool thing is that the lenses have a built-in ND filter -- something I've been calling for ever since video started to be grafted onto SLRs. And of course this unit has video, specified by a bunch of numbers followed by a bunch of letters... as if any of that matters much. I mean, I am sure it's fine. The system will be completed with three "Toy Lenses". Yes, they not only call them that, it's engraved right onto their barrel! The fish-eye, wide and telephoto varieties are designed to take bad shots right out of the box. That's "bad" in a good way, naturally. How much will all this cost? The zoom is $300, fish-eye $130 and other toy lenses $80 each. The viewfinder is a whopping $250 and the basic kit is $800. Yes, indeed, that's where the "premium price tag" in the title of this article comes from. If you've been reading my previous posts you know all about lens equivalence. So let's see where this camera fits. Relative to 35mm the 1/2.3" sensor has a crop factor of 5.53. That means that the 8.5/1.9 prime is equivalent to a 47/10.5 lens on full-frame. Yes, you read that correctly: f/10.5. Apparently the Q compensates by having something called "bokeh control" in the camera. My guess is that this is nothing more or less than a blur filter, likely one with a vignette mask so objects in the centre of the view are not effected. There's no way to fool Mother Nature when it comes to optics, so this new feature really has to be something this lame. Using the same analysis we find that the zoom starts at f/15 and goes downhill from there. Less said about that the better! Now let's check out my diffraction table, which I've updated just for the occasion. 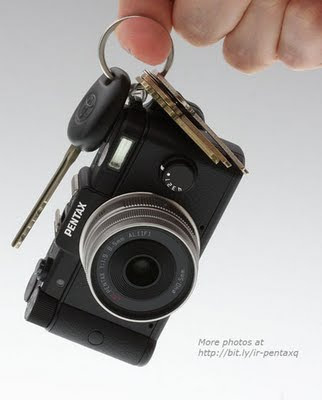 Given the number of pixels and size of the sensor, the Pentax Q is diffraction limited to f/1.6. This means that even the prime suffers the softening effects of diffraction no matter what aperture you use. This is a reminder that physics can't be beaten! The bottom line is that the body is loaded with features but the image quality will be extremely limited. There's good reason it's being marketed with the word "toy" prominent. So who is this camera designed for? Obviously not photo enthusiasts. It is also my experience that few people desiring a convenient camera will be bothered to change lenses. Anything that comes apart looks like it's broken. Not to mention the tech support issues involving dust on the sensor, etc. That leaves a target market of people who want something small for the sake of it and which is also expensive enough to demonstrate status. A camera that is fun and shows just how much cooler you are than all your friends with iPhones4. So, the market is rich Japanese kids. It would have to sell for $200 to get much interest from anyone else. 1 Shake Reduction (SR) in Pentax parlance. 2 Thane of Fife and a pretty sound guy. 3 Next they wonder why the camera is not focusing for them. But that's another story! 4 DPreview go way out on a limb and state that the Q is "a fun little camera that should still offer a more satisfying shooting experience than a mobile phone". Wow, really? Let's not aim too high! yeah I think the japanese will love this. While americans like everything big, the japanese love things tiny.